For high school athletes who persevere, who contribute however they can, who keep working to[more] get better despite not making headlines and being the star, Wednesday, Feb. 1, at the Bryant High School gym should be an encouragement and continued insentive. That’s when Ashlyn Lessenberry signed an NCAA letter of intent to continue her education and cross country career on scholarship at Henderson State University. In cross country, the top five finishers create the team’s scoring total but, as Bryant head coach Danny Westbrook preaches and his teams keep proving year after year, team success often comes down to those who don’t make the team’s top five. By pack-running and having your sixth, seventh, eighth — as many as possible — runner finish ahead of those that might be among the scoring group of an opposing team, you can win championships even though you might not have an individual runner come out on top. That’s the formula that won 7A-Central Conference championships in 2009 and 2010 for Westbrook’s Lady Hornets. Those teams included some talented under classmen and, though she occasionally finished among the Lady Hornets top five, Lessenberry was always among that next group of runners picking off opposing competitors. No headlines but Lessenberry, as a four-year letterman, was unmistakably an integral part of the team’s success since she was a freshman. As the coach mentioned, Lessenberry is also a member of the Lady Hornets’ softball team, which will be seeking its third consecutive Class 7A State championship this spring. As in cross country, she hasn’t been in the headlines in softball by cracking into the juggernaut starting line-up. But her contribution, asserted BHS softball coach Debbie Clark, has been no less important. “She’s an incredible teammate,” Clark stated. “My first year here, she received the coaches’ award. She was able to be an example. She’s always at practice, always works hard, gives us everything she’s had. The daughter of J’Anne Boyd and Lee Lessenberry, Ashlyn said she was drawn the HSU because her softball teammate Kayla Sory signed with the Reddies. 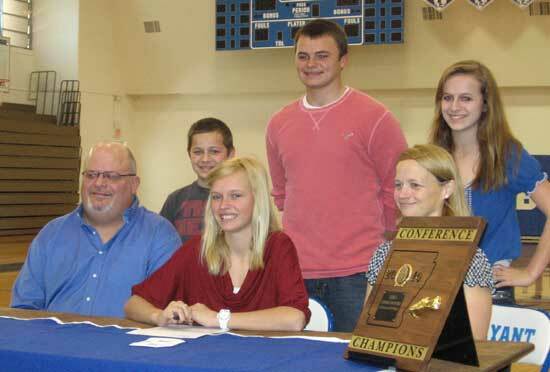 Lessenberry said she considered attending the University of Arkansas and Blue Mountain College in Mississippi. Lessenberry hadn’t run long distance before her family moved to Bryant before her freshman year. As for her academics, Lessenberry said her plans are to be a first-grade teacher. Congratulations to a great family!